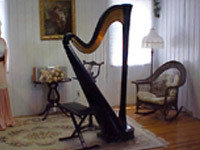 Private weekly lessons for both Lever and Pedal harp are offered here at Harp Haven. Lessons are designed with the individual student in mind, for all ages and skills. Adults are often reluctant to start lessons fearing that they are too old, however, they are usually very pleased with the progress made and the enjoy doing something they have always wanted to do. A variety of music is encouraged to develop versatility and unique repertoire. Students who are interested in performing will prepare for informal parties and weddings and will be referred to appropriate jobs when their ability reaches an acceptable level. 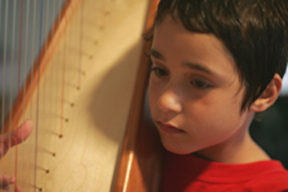 For our young students the "Children's Music Olympics" is available. Music Olympics is a summer music program that is designed to keep the student playing throughout the summer vacation and not experience the common setbacks from missing three months of lessons. Music Olympics begins in May and finishes at the end of August with a festive Recital for all students. Certificates and Olympic style awards are given along with applause for a great achievement.